We reached another milestone: the AAVSO International database now has over 30 million variable star observations! The 30 millionth data point was submitted by Josch Hambsch on the beta-Persei type binary ASAS J110744-5520.4 (EA/RS). I would like to take this opportunity to thank you all for your hard work and for enriching our dynamic database with great data. Your observations enable cutting-edge science to be realized, and provide researchers worldwide with data necessary to study and understand some of the most fascinating objects in the universe. Congrats to Josch and the AAVSO! Many thanks for letting us know about this milestone! I look forward to the next magic number being surpassed. I recall Josch being disappointed (not really!) by missing out on one of these. This ought to make up for that! Since I am getting sooo much data from my remote observatory competition is very small. I must admit that I got already 20th and 25th million observations submission on my account so it was natural that 30th million will go also. I am sorry for those of you who were counting on this milestone, too as I have still tons of data to be analysed and submitted. Another milestone (1.5 million (5% of the total) observations submitted by an individual person) will soon follow. I am adicted to variable star observations as you can imagine. Didn't we have a discussion before about this issue of how to counting observations made individually by a live person, vs. a huge number of automated observations made by a machine? the machine behind the observations is still me. I start, stop the observations, select the variables, analyse the data and sent to AAVSO and different persons. That takes me several hours each day as my remote site has on average 320 clear nights where I also observe. I also have a daytime job and hence I do not think there are many people around with such a dedication to variable star observations. All what counts is the satisfaction with your hobby whether you do visual observations or CCD obsverations like I do. Hello Josch, I understand what you are doing, of course. What I am talking about is the method that AAVSO uses to "count" observations by a given observer. Obviously, someone with an automated system that just goes and goes by itself between the "start" and the "stop", is going to add up 100-1000x the numbers of "observations" of say a visual observer, who has to locate and estimate each star manually. But the amount of effort by both is approximately the same. So, of course, unless some method is created to "level the playing field", from now on, basically all milestones of observations will occur during someone's run between the "start" and the "stop", totally swamp the observations made one at a time. Is that really meaningful? indeed a remote observatory with a CCD and automation software like in my case will always surpass visual observations. But this is life. If it would not be me others would do similarly. I guess a recoed of 10000 visual observations is as valuable as say 100000 CCD observations (or even more). I never did visual observations of variable stars as I turned from pretty pictures using CCD to variable star observations using also CCD about 10 y ago and doing science. This has accelerated since a few years by having a remote site with superb number of nights. I am also way ahead of anybody else in submitting individual observations to the AAVSO. I have probably more observations that the number 2-4 together. Since I observe nearly every night and keep observing the same stars over and over again for those in my observing list the light curve has been improved tremendously. Of course I can not compete with 100 y of visual observations of say SS Cyg. This one is not in my reach either being too far North. Every observer is rewarded by a certificate. I only got three so far (100k, 500k and 1000k) as I was too fast in submitting data for the AAVSO to follow. Of course one can discuss how to do the "counting" and "rewarding". Since I got already the 20th, 25th amd 30th million observations maybe I shoud leave the next 35th, 40th and 45th for someone else. I might go again for 50th million. Anyway except for 20th million there was not much publicity as I am not US citizen and am German living in light polluted Belgium. Anywy, I will keep sending data to AAVSO and accumulate numbers never seen before. BTW I am AAVSO member since 2009 only. I have much adminration for what you do and my dream is to perform close to what you do, though I don't thing I could affort to do that. Nonetheless, you are an inspiration and this help be improve my performance. I too admire what you can do and hope someday I can do a fraction of the same work. You have invested a lot of time and money in your setup. I am very appreciative that you can provide million+ observations to the scientific community. If one cant fly to the stars to understand them better, the next best thing is to build a "spaceship" at home to discover what the stars hide from us. As far as observing goes I'm more in Josch's category; although at only a little more than 50K submitted, I'm just a "baby!" I couldn't have contributed as much data without an automated telescope, focusing, changing filters, plate-solving variable star fields, etc while I sleep! However, I'm not sure numbers mean as much as the quality of observation and error free variable star estimates with transformed magnitudes. Since astronomers used film and then solid state detectors after the mid 20th century to record stellar data, accuaracy and quality of data have greatly increased. It isn't a coincedence that the first exoplanets were discoved right after wide-spread professional use of CCDs occured in the early 1990s and stellar magnitude estimates had accuracies in the 4th-5th decimal place. I guess there is a certain viceral excitment to viewing stars with your own eyes. However, since I got my 1st large apeture (17") telescope, I've yet had a chance to place an eyepiece on it. I know anything I look at (with my poor eyesight) will be vastly inferior to what the charge-couple device can image in 10 seconds! Stella's first word of her post say's it all - "We". I see no point in belittling this fine work by bringing in 'competition' where none exists by using phrases like "leveling the playing field". A fine achievment by all in whatever capacity we observe. All the earliest milestones in AAVSO history were made by visual observers. Everyone had an even and fair chance to reach a "magic number". With automated systems, unless everyone uses automated systems, this puts visual observers and photographic observers, DSLR observers in a situation where its a practically zero probability a single observation will hit a million milestone in the middle of someone's time-series run or such. Of course, it doesn't matter, unless these milestones are made a big issue. But since they seem to be, then all I am asking is a way to "normalize" observation counts to realistically respect the amount of effort each observer puts into it. Isn't it just fair? Of course, I realize the world is changing now, and CCD is going to totally dominate AAVSO in short order, but if we wish to retain any visual observers at all, we need to at least provide some incentive for visual to remain alive. So, adjusting observation counts by manual vs. automated systems is an absolute must to achieve this. Milestones celebrate our work at the AAVSO, and they are an opportunity to take a step back and recognize our accomplishment of gathering another one million of new data points every time! Most importantly, they represent enriched light curves and a wealth of information that is there to be harvested by researchers worldwide. Because of all your data in the AID, we have the opportunity to study and understand the mechanics of those stars. And there is a lot to learn! Thank you all for your hard work! And please keep observing! Dear Stella, I truly appreciate your comments, but I feel pretty strongly about this issue here, of a SINGLE telescope system dominating the data in the AAVSO database? AAVSO's data has historically been really top notch, due in the main, to the vast numbers of DIFFERENT observers contributing in a more or less equal fashion. As a result, the "law of large numbers" of randomness guarantees convergence, the accuracy. Now, it looks like a single observer, using mainly one system, has said in his own words, he intends to dominate the data in the AAVSO. Can we stop for a moment and think about the consequences here? Systematic error, is the scary word. I guess here is something wrong in your perception. I have never said I am going to dominate the AAVSO. I will continue sending data to the AAVSO as much as I can generate, even with your criticism. If you see my publication record where professional astronomers are astonsihed about the qualiotry of the data using a small scope then you would not question the data I submit. You can also check many of the stars light curves I subvmit which are more consitent than scarce data from other observers. Just look at QX Pup. I will now stop discussing with you as I have the feeling there is more behind than just scientific arguments. Please read the article in the recent “Scientific American” about big telescopes. You may get some insight on this subject. What a great time to celebrate having posted our 30 millionth observation! This is a great tribute to our many observers and adds to our legacy as the most prolific organization in the world. Our continuous record of observations spans more than a century and will provide data for generations of astronomers seeking to solve problems of stellar evolution. About the milestones: Couldn't we just celebrate a few more? One for the total number of observations, one purely visual, (one for PEP, one for historical data, ...)? Just more opportunities to put a method, observer, ... in the spotlights?! I'm for separate CCD, vis, PEP, and spec awards! CCD is the easiest method to gather many obs, especially if you've got a remotely operating system as HMB does. Then follow visual, then PEP and finally spectroscopic data. If you are of a competitive mindset, then you'd not give spectroscopic a second glance. I started out as a PE photometrist, but with the difficulties I had in getting my telescope to track on the stars, I settled for short CCD shots. In 1968 used the 30 inch at McDonald Obs to get spectra of RZ Cas at primary minimum to see if there were any emission lines (there weren't). I'd have gotten 3 or 4 observations that night. Hard work, guiding. Meanwhile, I'd built a few 'scopes that weren't driven. When I realized the power of CCD's, I switched. I designed a few clock driven mounts. It required a lot of work on my mounts before I could get the tracking acceptable (even for short exposures). Now, I can shoot a two minute exposure, without making any tracking corrections. I'd vote for separate recognition in all categories, but recognize ALL efforts. "Every owner of a small telescope, who uses it to any extent, must have felt...there was little to be accomplished with such equipment, that would be worthwhile; and it is a fact that only by the observation of variable stars can the amateur turn his modest equipment to practical use, and further to any great extent the pursuit of knowledge..." - W.T. Olcott (1911) Founder of the AAVSO. Just wanted to remind everyone what the fundamental purpose of our organization has been from its very beginning. So that all amateurs, mostly with very modest means and equipment, can make significant contributions to scientific research. I think a general problem we face these days is a worsening feeling that the world is controlled by the big guys with the big money, average people are made insignificant as a result. I can appreciate Olcott’s comment, but also recognized that times have changed. There was probably a time, even Olcott’s time, when an important survival skill was the ability to hitch a team of horses. No longer. The ‘new normal’ is computer controlled or large aperture dob scopes. A ten inch amateur telescope in Olcott’s time was probably unheard of. AAVSO has done a great job of keeping opportunities open for all observers. Things like VSP, LCG or Vphot were just things of the imagination only a few years ago. Campaign alerts often provide opportunity of all levels of observations. And yes, there are even charts and tutorials available for binocular use. I know for certain that some members are producing data used in published papers, collected from pay-for-use telescope sites. AAVSONet can fill the same purpose. Imagine that, you don’t even have to own a telescope and get useable data and contribute. I do think the opportunity for someone with a four inch backyard telescope to make ‘significant contributions’ have changed. There is still value in observing LPVs with small telescopes, to maintain the long term coverage. But surveys are starting to have impact and that is only going to increase. GAIA and LSST are going to produce thousands of targets, just like ASAS-SN already does. Some members will ride this tidal wave along by doing follow up time series photometry, something the survey’s won’t do. In many cases, that can be done with the ‘modest equipment’ of today. But even this level of contribution comes from people doing the observing for the personal satisfaction; it’s just fun. So my hat’s off in appreciation to all those who jump in and do the observing, with whatever approach they choose. I dabbled with automated astronomy about ten years ago and I can only imagine the sense of pride and accomplishment that Josch has in constructing such as well-oiled machine. That is to much extent "awe-some." I am curious about Mike's question on systematic error. How much of a problem is this, especially if in the next decade an amateur or small group of amateurs become a significant amount of the total AAVSO data set? Is it something that can be "ironed out" in the analysis? I honestly do not know. This line of thinking fills me with mixed emotions. If a small group of amateurs doing highly automated stuff produces high coverage and high quality data, then absolutely, go forward! Support it! Take resources away from activities that produce less quality data! It is about the data, not the observers' personal feelings. If it makes my observations superfluous, then that is the way it must be. So, I think it is very important to have mechanisms that allow even the modest observers here, to be able to share and receive acknowledgement for their hard work in the news that are published. I been looking for you. I knew guys like you would be out there. I know there will be more. Hope to join you again one of these days. I had about 0.5 % of the OBS at one time. It's going to take some tens of thousands of us with various apertures to cover the whole sky. Think of the astrophysics from that database!I hope the AAVSO makes folks like you available so we can learn from your experience. One thing I learned personally, is how much work it is to reduce all that data. Also how easy it is to make a wild mistake when handling that much data. Thanks to the AAVSO for helping me clean up my past dta errors! I always strived for accuracy and always had doubts about my error bars, given that my data stream was steadier than the AAVSO errors on comps. I hesitate to make another long run because I want any future work to meet even higher standards. The VPHOT class was valuable for me, but I am waiting for it to catch up with Richard Berry's software for ease of use and ease of handling 500 or 700 hundred images in a reasonable time. I was always looking for planet transits. I plan to upgrade from my G11 Gemini to a system like yours. I think VPHOT could be be updated to do photometry on a dozen suitable stars in the F.O.V. of a series run. 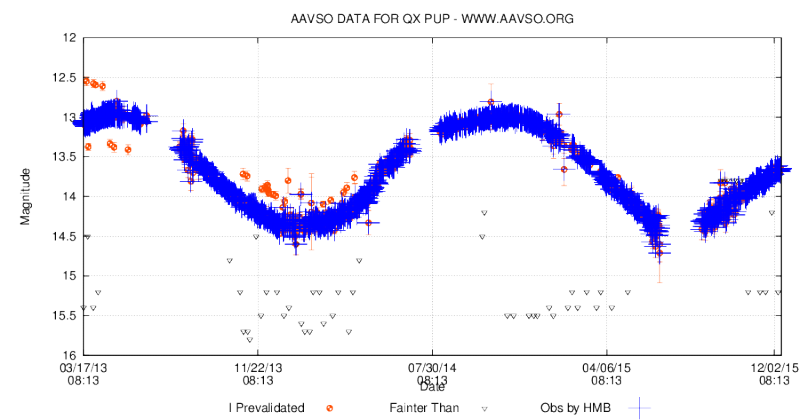 Another thing that is kind of amazing is the output of Arnie and the AAVSO's comp group. They must have 5 - 10 million observations just there. I don't think they win any prizes for that, but without them, our CCD observations would be as valuable as pretty pictures. I do appreciate the visual guy's observations, but would like to level the playing field. Lets make all visual observations be done at at 10 degree F +/- 30F or when the mosquitos are thick enough to carry the telescope away. I started in 1963 with visual and the AAVSO would not accept my observations. 1983 saw PEP work which we at least got to publish. Then came about 7 years of UVBRI on a CCD. The equipment is hard to maintain in winter. Now I do visuals with 80mm binoculars. Hope we have a thousand more binocular observers. It developes an appreciation for good CCD work.